Call us for a full disclosure of homeowner references you may contact, and learn why we are San Antonio's leading source for granite countertops. We visit your home to review your needs, you are then invited to meet with our expert at the Granite Yard to pick out the perfect granite for your project. Granite Countertops of San Antonio delivers the finest granite countertops and cabinets at the lowest overall price in the San Antonio Area. Granite Countertops and Custom Cabinets is our families only business, and we have served the San Antonio area for over 10 years. Providing expert design consultation, fabrication and installation of custom granite countertops by a team of skilled and experienced craftsmen. Granite Countertops, we are a one-stop shop and we will work with you in any way that suits you. 2) Disconnect the stove top and remove the sink. 3) Then the new countertops are installed, back splash and sink. 4) Your new granite countertops are polished and sealed. Plus, if your needs include cabinets for your new kitchen counters, we also sell wood semi-custom cabinetry up to 70% less than big box stores! - We only work with full granite slabs. the best granite slab and the correct material for the job. support, better durability, more beautiful finished job. - Hundreds of kitchen granite colors and styles available. - Great prices on remnants for vanities. 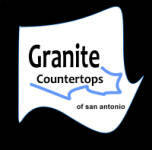 "We are the lowest price provider of quality Granite Countertops in the San Antonio Area!" GRANITE COUNTERTOPS THAT BRING "NEW LIFE" TO YOUR KITCHEN OR BATH!